IP Addressing – Document IP addresses for all network interfaces, including the intra-array interface and any virtual IP addresses when using NLB. 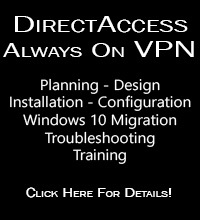 If you are using VPN services, be sure to record IP address ranges for remote access clients and site-to-site networks. Routing – Document any static routes required for “network behind a network” scenarios. DNS – Record any and all A host records or CNAME alias records in DNS associated with your ISA firewall. This will include statically configured host records for the ISA firewalls themselves, alias records for the proxy array, or WPAD records for client configuration. WPAD – If you are using DHCP for client configuration, be sure to plan for those changes as well. Certificates – Be sure to export any and all certificates (along with the private keys) required for operation. This includes machine certificates in a workgroup scenario and SSL certificates used for HTTPS publishing rules. Be advised that Windows Server 2008R2 includes fewer trusted root CA’s by default, so check your certificates carefully. Active Directory – If you have published web sites utilizing Kerberos Constrained Delegation (KCD), configure the computer account of the new system for delegation. If you have created a Service Principal Name (SPN) entry in the Kerberos database for the Configuration Storage Server (CSS), review and update that information as necessary. Third-party Plug-ins – If any third-party plug-ins are installed on ISA they will be disabled after being migrated to TMG. Visit the vendor’s web site to see if an updated plug-in for TMG is available. Scheduled and Custom Reports – Document all reports, as they will not be migrated to TMG. Do not assume that migrating to TMG will resolve any existing problems in your current environment. Use the ISA Best Practices Analyzer to perform a system health check and resole any outstanding issues prior to migration. System capacity should be evaluated when planning a migration from ISA to TMG. Although there are performance benefits when running on the latest 64-bit Windows operating system, TMG includes many new advanced protection features, and these capabilities consume additional resources. Use the Forefront TMG 2010 Capacity Planning Tool to determine if you have adequate hardware resources to support your implementation requirements. Once the planning phase has been completed and the configuration of the new TMG system has passed initial testing, you can begin the actual migration from ISA to TMG. For ISA Enterprise Edition, be sure to select the root node for the Enterprise, as shown here. The Export Wizard dialog box opens. Select the option to Export confidential information and enter a strong password, then select the option to Export user permission settings. Specify a location to save the XML export file. This file will be copied to the TMG system for import later. Review the settings and then choose Finish to begin the export. Before importing a configuration to TMG, make certain that the Getting Started Wizard has not been run. 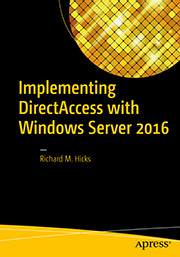 This wizard will configure basic access rules that may prevent a configuration from importing properly. If the wizard has been used, remove any existing access policies created by the wizard prior to importing a configuration. Note: When migrating from ISA Server 2004/2006 Enterprise Edition to TMG Enterprise Edition (EMS-managed) you must import the configuration on the EMS prior to creating an array or adding array members. Also, migrating from ISA Enterprise Edition (single array/single array member) to TMG Enterprise Edition in standalone mode requires an additional step before importing to TMG. For more information, please refer to the note at the end of this post. For TMG Enterprise Edition (EMS-managed only), be sure to select the root node for the Enterprise, as show here. The Import Wizard dialog box opens. Copy the previously exported XML file to the local TMG system, and then specify that location here. TMG indicates that the export file is from an earlier version and that it will be upgraded to Forefront TMG. Enter the password created during the original export. Review the settings and then choose Finish to begin the import. After successfully completing the migration process, TMG indicates that additional steps may be required. Address any issues as necessary. Click Apply to save changes and update the configuration. Note: If you have imported any web publishing rules that use HTTPS, verify that the correct SSL certificate is bound to the appropriate web listener used by the publishing rule before applying the configuration. Before importing the configuration from ISA Enterprise (with a single array and a single array member) to TMG Enterprise standalone, it will first be necessary to convert the export file to a format recognized by TMG Enterprise standalone. This is required because the ISA Enterprise export contains Enterprise-level configuration and policies which are not supported by TMG Enterprise standalone. To convert the file, download and install the EE Single Server Conversion Tool for Forefront TMG included in the Forefront TMG Tools and SDK. This will convert the ISA Enterprise configuration file to a format supported on TMG Enterprise standalone. Once the file conversion is complete, the process of importing from ISA Enterprise single array/single array member to TMG Enterprise standalone is the same as importing from ISA Standard Edition. If you attempt to send the PASV command, you’ll see that the remote FTP server accepts the command and enters passive mode. However, you will still be unable to list the working directory, with the connection failing or receiving one of the messages listed above. By default, TMG does not support active mode FTP. I won’t go in to all of the details of the FTP protocol here, but understand that FTP is a complex protocol that uses a control channel and a data channel. 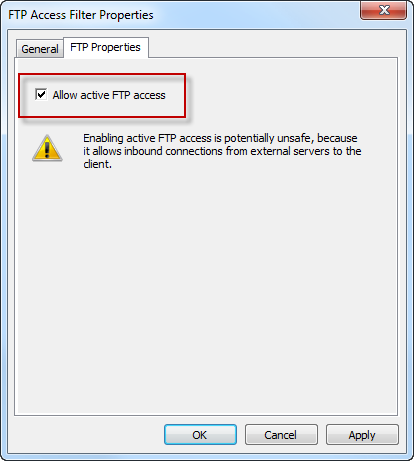 With active mode FTP, the data connection is initiated by the FTP server, not the client. With passive mode FTP, the data connection is initiated by the client, which is not only more secure, but also more firewall and NAT friendly. You can learn more about the difference between active and passive mode FTP here. 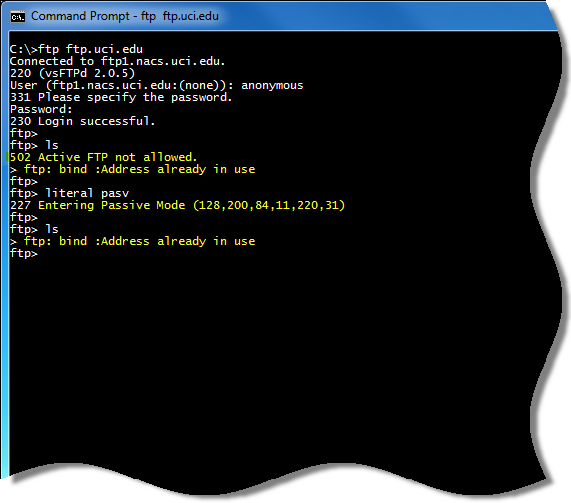 The real problem is that the Windows command-line FTP client does not support passive mode FTP. The best way to resolve this issue is to use a client that supports passive mode FTP. 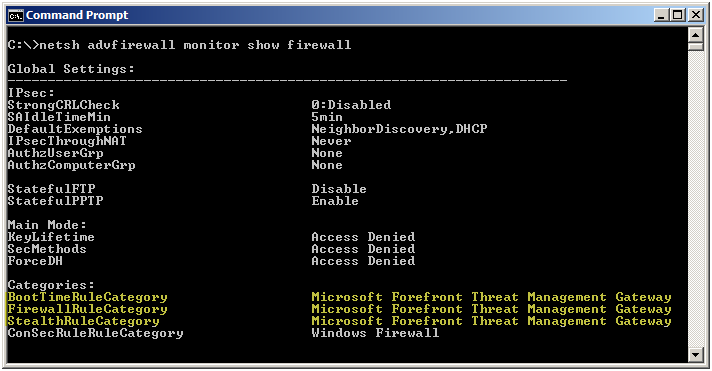 If you must use the Windows command-line FTP client, you can configure the TMG firewall to support active mode FTP. As Yuri Diogenes points out in a recent blog post, this can be accomplished by opening the TMG management console, highlighting the System node in the navigation pane, then right-clicking on the FTP Access Filter and choosing properties. Select the Properties tab and check the box next to Allow active FTP access. With previous versions of Microsoft ISA Server running on Windows Server 2003, the Windows Firewall and Internet Connection Sharing (ICS) services were disabled by default. After installing Microsoft Forefront Threat Management Gateway (TMG) 2010, you may have noticed that the Windows Firewall service is still enabled. The reason for this is that the TMG Firewall integrates with the local Windows firewall instead of replacing it. This is made possible by the Windows Filtering Platform (WFP) which makes incorporating firewall services in to the operating system’s networking stack much easier. If you take a closer look you will see that TMG is simply a Windows Filtering Platform registrant. Having the Windows Firewall service running on a TMG firewall is by design. Since TMG depends on the Windows Firewall service for operation, and the Windows Firewall service can be configured via Active Directory Group Policy, there is the potential for conflict that may result in the TMG firewall not working correctly. To avoid this scenario, create a separate OU dedicated to the TMG firewall systems and filter out any GPOs that make changes to the Windows Firewall configuration. 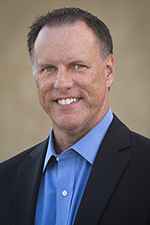 According to an article in the Orange County Register, The NCAA Men’s College Basketball tournament (aka March Madness) will cost businesses an estimated $1.8 billion dollars in lost productivity. This is where the URL filtering capabilities of Microsoft Forefront Threat Management Gateway (TMG) 2010 shine! With integrated URL filtering enabled, security administrators can simply configure an access rule allowing limited access to the Sports category (perhaps during the lunch hour only) or perhaps even block the category completely. The result will be improved productivity and significant network bandwidth savings during the tournament. A comprehensive reference dedicated to the ubiquitous Wireshark protocol analyzer, authored by the foremost expert in protocol analysis and Wireshark, Laura Chappell, is now available for pre-order. Due to be released on March 29, 2010, you can view sample pages by visiting wiresharkbook.com. Be sure to visit wiresharktraining.com and chappellseminars.com for additional training and reference material.